In the Fury of the Bear expansion to Tide of Iron, you take command of the Germans or the Soviet forces as war on the Eastern Front begins. The Fury of the Bear expansion for Tide of Iron builds on an already epic game experience by adding the forces of an entirely new nation as well as new vehicles winter terrain scenarios and more! Featuring nearly 100 plastic figures for the Soviet army plus new German figures tokens cards and 9 new Eastern Front map boards the Fury of the Bear expansion will let you experience Tide of Iron in an entirely new way. In addition Fury of the Bear will also offer exciting new mechanics such as a combined strategy deck a system of counter intelligence known as subversion and all-new specialization types! With all these additions not to mention the most tanks of any Tide of Iron release Fury of the Bear will expand your options and challenge your strategies! Are you prepared to face the fury of a nation? 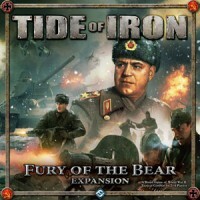 Add a Review for "Tide of Iron: Fury of the Bear"